Metamorphic reaction of a gabbroic protolith to an eclogite. Welcome to the homepage of the Petrology group at the University of Bern. We aim to understand rock-forming processes from the micron- to orogen-scale in the Earth's crust and mantle. For this purpose, we use subduction-collision orogens as natural laboratories to study phase and melting relations and to constrain chemical cycles through a combination of metamorphic petrology and in-situ geochemical analyses. These observations are complemented by numerical models and experiments under controlled conditions. Our research combines fieldwork, petrography and petrology with advanced analytical techniques in a dynamic team of students and researchers from different areas. Mon Viso: A slice of oceanic crust that has been buried to 80km depth during subduction. The ophiolite marks the suture zone between the Adriatic and European crust. 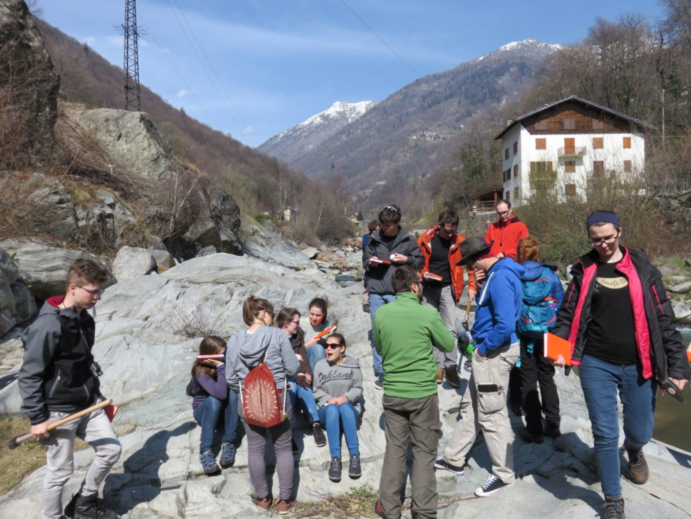 Fieldtrip with first year students to the Sesia Zone, Western Alps.